A home’s heart is its kitchen. 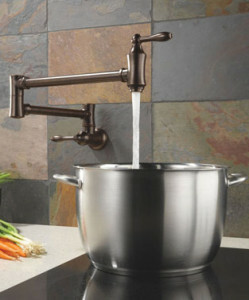 Most luxury homes have advanced past having its kitchen be simply functional. In addition, the home’s central room needs to be an upscale showcase, combining functionality with high-end tastes. With the tops of your island and your counters being the focal point of your kitchen, you want to make sure they stand out. Granite has become the most requested countertop material, but be sure to check the rating on it first. Not all granites are the same. They are graded on a scale of 1 to 5, with 5 being considered the very best quality. Instead of the typical polished granite, perhaps look into more rare granite countertops with honed, brushed, or suede finishes. There are options beyond granite, as well. Rapidly growing in popularity are the highly durable quartz countertops. Not as durable, but lovely to look at are marble countertops. (Marble countertops are best for those who do not use the kitchen as much, but still want it looking fantastic.) For those looking for unique designs, there are various other counters made up from natural stones or even from sealed woods, created to closely match the kitchen cabinetry. For those still using a single oven that is part of a standalone stovetop range unit. It’s time to upgrade to a double wall oven. The upper and lower ovens can be used independently of each other, with different meals being prepared at different temperatures. For those households that need to, one oven could be designated as the gluten-free oven. If your kitchen is big enough, you may even want to consider room for four wall ovens, with one of them being a microwave and another being a steam/convection oven. 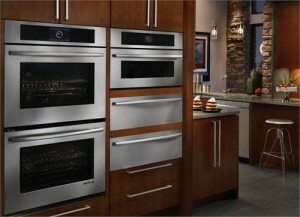 When shopping, be sure to look for the newest models of ovens, which will feature systems that can prepare food up to 15 times faster, as well as ovens that can be operated by smart phone apps or over the Internet. Google’s Android, the same operating system used to power more than half of all U.S. smart phones, also now makes an operating system for smart ovens. While most designing their kitchen may not realize it in advance, the most expensive and time consuming portion of the new kitchen tends to be its cabinetry. For high-end homes, custom-made cabinets are the way to go, designing them to the exact dimensions of your new kitchen, and enabling the kitchen designer to make best use of every inch of wall space around the built-in appliances. (Semi-custom cabinetry, with some standard sizes mixed in with custom sizes could work, as well.) Be sure to add toe kicks to the base of the upper cabinets and valances to the tops of the upper cabinets to help conceal under/over cabinet lighting. Other considerations include creating coffee stations, “bread box” or “garage door” cabinetry to hide countertop appliances when not in use, Lazy Susans in corners, easy-glide pull-out drawers, self-closing drawers, full-extension drawers, retractable trash can, wine racks, glass doors, and cabinet covers for built-in dishwashers and refrigerators. While tile floors are the norm, wood flooring in the kitchen has made a huge comeback. For those looking for eco-friendly alternatives to standard wood flooring, bamboo flooring is growing in popularity. Bamboo offers a wider range of coloring from white to charcoal, as well as light-dark mixes. However, for homes where the kitchen will get heavy traffic from dogs’ claws, high heels, work boots, or shoes with sand from the beach on them, you may want to consider more durable flooring. Stone flooring, using such materials as granite or quartzite makes for lovely and tough alternatives to tile or wood. Add a television to your eating or food prep area. The flat screen televisions can be recessed into walls to keep with the smooth sightlines of the rest of your new kitchen. Whether you’re thinking about remodeling your home in the New Year, or are considering purchasing a new luxury home, contact Norka Parodi and The Norka Group — South Florida’s real estate experts — at 561.571.6489. Search luxury homes in Palm Beach County. Search luxury homes in Broward County. Image credits: wall ovens from Jenn-Air, pot filler from build.com, and black/white luxury kitchen by HomeDesign.